Went 2 the Bridge: Bloodless Coup As Media Selects A New "Decider" For U.S. 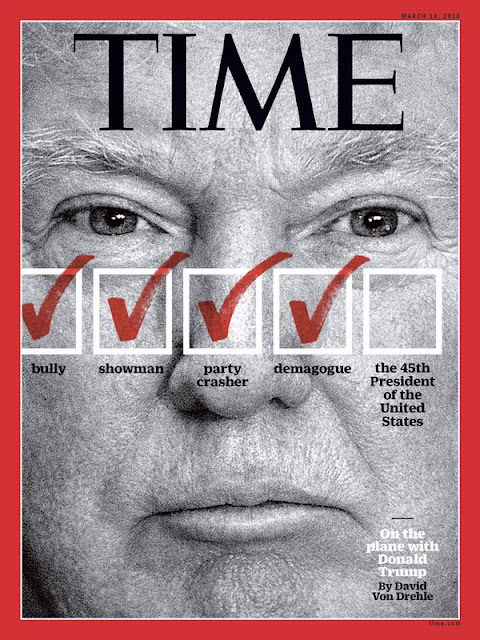 Bloodless Coup As Media Selects A New "Decider" For U.S. I have been wrong before, but I called this one spectacularly wrong. I suppose Trump being anointed by the press a long while back should have tipped me off that there was a bloodless coup coming. Wall St. is freaking out and stock markets are tumbling. Looks like two factions of our shadow government are at war with each other, and the media won. Because, as we know, propaganda works. My screen grab of the New Yorker magazine "most read" list from last week. Will people eventually catch on that saying a candidate's name over and over helps build their brand recognition and significantly increases the likelihood that you'll wake up to find them voted into office? My family in Australia wrote to ask if I had put in my application for immigration yet. I think younger people who are appalled by waking up to find themselves living in Hitler's Germany will be (already are) leaving in droves. That will make things even worse, probably. It certainly now officially ends the hundreds of years when the U.S. was viewed as a desirable destination for immigration in order to pursue the American Dream. What's left of it, anyway. Health insurance premiums under the health insurance you're required to buy from powerful wealthy corporations is set to go up by more than 100% next year in some locations. Electing Clinton wouldn't have changed that one whit. There will now commence much shaming of those of us who voted for Green Party candidate Jill Stein. My husband will be blamed for the coup in the same way that he has been blamed for years for supporting Ralph Nader for president in various elections. As if Maine was a swing state in the bizarre electoral college system. If we had ranked choice voting, like other wealthy nations, the false dichotomy used to drive voters to the polls would evaporate overnight. The person who should be most ashamed of himself this morning is Bernie Sanders. If he had not made the back room deal to galvanize idealistic youth into the Democratic Party fold and then abandon them to Clinton, he'd be celebrating victory right now. Instead of sitting in his brand new $650k vacation home on Lake Champlain wondering how he got there. The silver lining for me is that maybe now all the numerous people who used to oppose U.S. wars when a Republican was in the White House will come back out of hiding. Eight years of Barack Obama killed the antiwar movement except for a few radicals like us. Not sure I have the will or endurance to continue in this Merica. Trump pulled the curtain back to reveal how truly ugly we are.